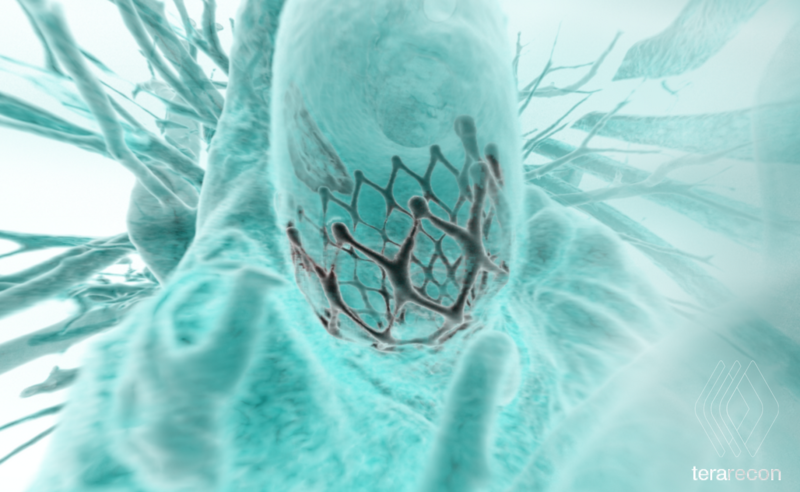 The TAVR (Vessel Analysis) package provides features including aortic root segmentation and orientation, Centerline pre-processing and extractions, user definable planning templates with report output, and embedded instructions. Other features including multi-series loading, straightened view, diameter and length measurements, CPR and axial renderings, as well as charting of the vessel diameter, distance, and cross-sectional views. TeraRecon iNtuition Solution Clinical Packages include iNtuition and AquariusAPS. The patient list displays patient studies available for loading. Scroll through the preview images for content verification. Load Cardiac CTA series to TAVR workflow. Select "Aortic Root" workflow element. Scroll through images and Shift-click on the aortic valve. Aortic root is segmented automatically. Tools are available to modify the result as needed. Click "Oblique" workflow element to create an automated orthogonal view of the valves. Select the MPR panel crosshairs until the lowest point of the aortic leaflets are resting on the line. The Aortic hinge points should disappear at the same time on the short axis view. 3D VR Perspective view is available from right mouse right click drop down menu. Click "Measurements" workflow element to start measurement protocol. iNtuition is preloaded with a general TAVR protocol but new ones may be created and selected from the drop-down menu. Select triangle button and follow instructions below. Continue working down the list of measurements, using the measurement button and directions each time. Capture image of each step for the report. Click on Embedded geometry and make selections to use for planning. Embedded Geometry can be repositioned from 3D view.